Before I discovered Just Intonation and Microtonality I thought that I had a pretty strong grasp on what music was. But boy was I wrong. I stumbled into the world of Just Intonation music by mistake… it was like seeing a brand new world for the very first time. One that had long existed in beauty, splendor, and majesty, but for me it had sat there behind the wardrobe, powerful, glorious, but unused and ignored… yet patiently waiting. 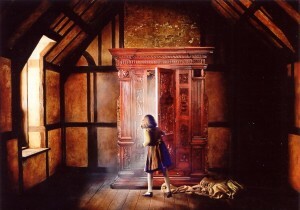 I stepped into the wardrobe and experienced new and exciting possibilities that were previously inconceivable. Standing there transfixed in this new world, I experienced new flavors of taste and harmony. 12 notes per octave… What I thought before to be the universal truth of music, the foundation… it certainly was not. There were shortcomings with 12 ET. It was a relatively recent invention and it was small when compared to the world of Just Intonation. I had been living inside of a 2-dimensional monochrome world, while the portal to a bright and colorful multi-dimensional new existence was staring me straight in the face. Now don’t get me wrong. 12ET can produce some beautiful music. It closely approximates many of the lower partials of the overtone series. I will always play and listen to music based on it. But it is just one way of looking at things. Just Intonation opens the doors to an unexplored world of sound and the relationships between pitches. These are real and meaningful musical harmonies. In Just intonation you have a wealth of harmonious treasure, far more so than what 12-ET can offer. There are so many different ways to combine tones that are just not possible with 12 equally spaced tones per octave. We are accustomed to hearing 12ET even before birth, so hearing music based on Just Intonation is probably going to seem a bit strange to us at first. But the reality, believe it or not, is that 12ET is out of tune, and because it’s an equal temperament with only 12 notes, that also limits us in what we are allowed to do creatively. Surprised? Just Intonation is just so much richer and deeper in many different ways. There are some equal temperaments that are amazing. 72 is probably my favorite and I’d put it up against JI any day. 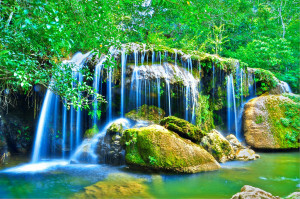 If playing in 12-ET is like swimming in a swimming pool at a hotel resort, then playing in Just Intonation is more like swimming out in the Hanauma Bay in Oahu Hawaii, or in the charming rivers of Bonito, Mato Grosso do Sul in Brazil. Sure the resort swimming pools are nice, but the latter are more natural, and far more exciting in my book. 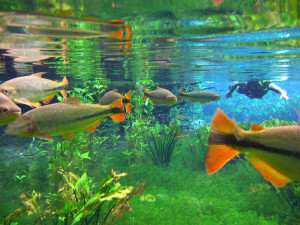 They may be a bit more dangerous and less tame, and the process to prepare for swimming in them may take a bit more work and time, but the possibilities of experiences that can be had far exceed anything in a closed up and manicured hotel resort swimming pool. With 12ET or any equal temperament for that matter you’re dealing with something that is like a circle that loops over and over with the same elements that were there before. Which can be constant and stable, but limiting. Just Intonation scales are like different arrangements of the Harmonic Series, which is more like an open ended spiral that never ends. There is more “danger” there for running into some dissonance that you’ve never encountered before. That can be a bit unsettling and scary at first, but there is also the possibility to find and experience beauty and excitement that would never have entered your heart before. 12ET has helped us move forward in music in some amazing ways. But I truly believe that it would be very unfortunate if we stall there and begin to think of our 12 ET system as the pot of gold at the end of the rainbow. Or think of it as more “musical” or more in tune than we would the harmonic series which is part of nature and sewn within the fabric of reality itself. I truly think it would be more healthy to view music as something more like an organic thing that is lived and breathed, and a bit less like a cookie cutter one size fits all package. Instead of trying to fit everything into a mass produced 12-ET world with instruments that are conformed to a standard that isn’t based in nature. I’d love to see us be more creative and open minded about tonality and even the instruments that we use to express it. Much exploration, adventure and discovery await us if only we’d open our minds, our hearts and our ears to something different than what we’re accustomed to. If you’d like to dive in deep, then perhaps this is a good place to start.